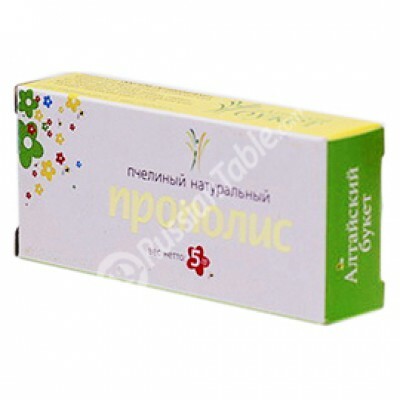 Propolis natural 5 g buy for 6.9900 in store RussianTable with delivery. With the addition of roughage and water, the human body can survive on honey bee pollen alone. This is because it is the only food which contains, in perfect balance, all 22 known essential nutritional elements (and others yet to be identified), which humans require to achieve and maintain optimum vitality. That's why it has rightfully been called the "Ultimate Survival Pack". At least 2% of the contents of honey bee pollen has yet to be isolated and identified In its original state, pollen is a fine powder composed of thousands of microscopic particles which are discharged from the anther of a flower, and is the male element of the plant which fertilizes like plants. There are two kinds of pollen: anemophile ("friend of the wind"), and entomophile ("friend of the insect"). The former, which causes allergic reactions like hayfever, is dispersed by the air. The latter, which is the subject of this information, is gathered by the honeybee, whose travels from flower to flower make possible the reproduction of more than 80% of the world's grains, fruits, vegetables and legumes. The individual pollen grain in encased in two protective coatings. The exine, composed of sporopollen and cellulose, is known to be acid-resistant, and has withstood temperatures in excess of 300 degrees C. Beneath this is the thinner, intine layer, which preserves oil and starch. The honeybee collects only the purest of pollens. It avoids all toxic plants, including those contaminated with pesticides The general RDA is about one tablespoon (measured). 1 pound of pollen contains approximately 31 tablespoons (measured). Each Tablespoon is equal to about .516 ounces or 14.7 grams. We always recommend that anyone with any unhealthy condition or suspected sensitivity see their doctor before ingesting honeybee pollen. Do you have any questions about Propolis natural 5 g?